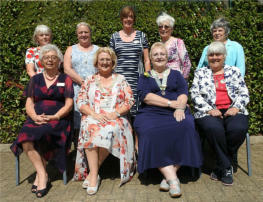 Summer Rally 2018 The members of Clevedon Inner Wheel were delighted to host the Summer Rally, which was held at the BAWA Club in Filton, Bristol. This event is always the highllight of the District10 Calendar and this year was no exception. The weather was hot and sunny, but the venue had excellent air conditioning, which some members thought was too good as they felt chilly! The Rally followed the normal programme of formal and informal photgraphs before the meeting. Immediate Past Chairman Pat welcomed everyone to the Rally and then handed the chain of office to District Chairman Gill, who then handed out the bars to the retiring members of the Executive and incoming members of the Executive. Greetings were received from District 1, 15 and 20 and the Rotary President of Clevedon Yeo. President Ann Fox said grace before everyone sat down to a lunch of Roast Beef and Yorkshie Pudding followed by Lemon Roulade and Coffee. 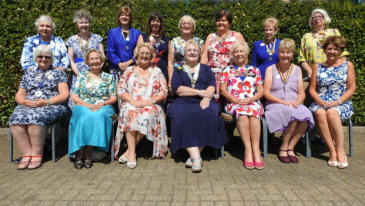 After lunch District Governor Joan Goldsmith brought greetings from Rotary District 1100 and this was follwed by an address from Association President Ann Acaster. Ann spoke about her journey through Inner Wheel over the past 25 years before speaking about her chosen Charity, Jessie’s Fund. Jessie’s Fund helps seriously ill children, and those with special needs, through music. Founded in 1995 in memory of a nine-year old girl, whose parents believe music has the power to help children and young people who have difficulties communicating. One way members can supoor this charity is to collect unused or broken watches and old costume jewellery. These will be collected at the Conference in Cardiff and sent to Jessie’s Fund to be converted into money. District Chairman Gill presented Ann with a small gift and a cheque for Jessie’s Fund. 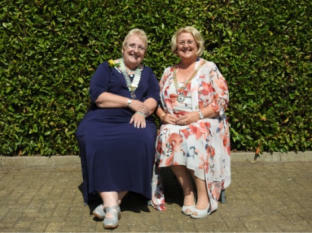 Memeber of Council Sherry Phillips gave a vote of thanks, and this was followed by President of Clevedon Ann Fox who thanked everyone for coming and wished everyone a safe journey home.